Diffrent Music is a label reputable for its approach to signing diverse tunes based principally on passion as opposed to trends. 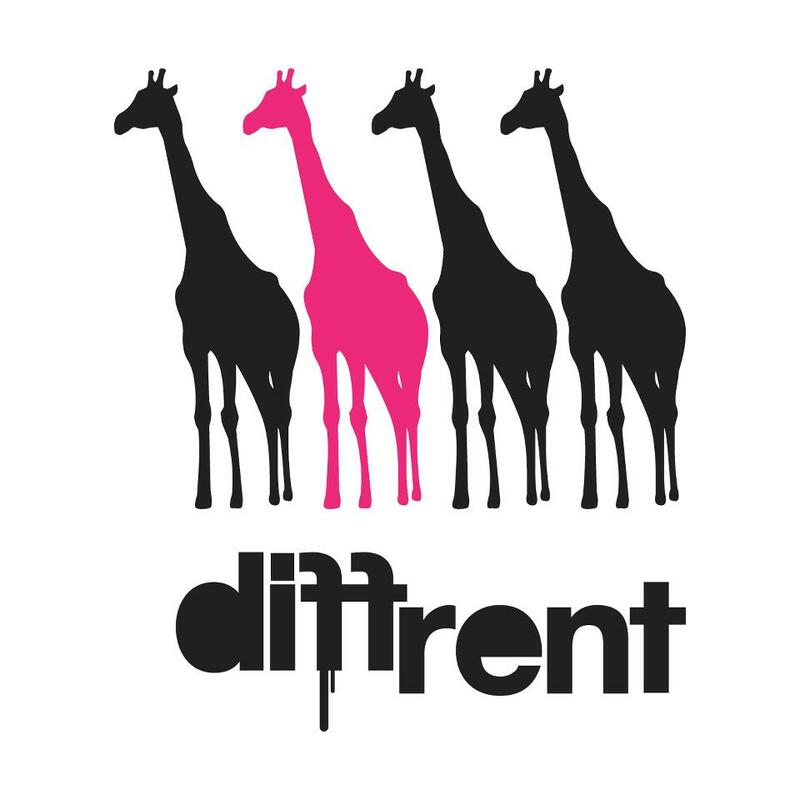 As a platform that enables artists of the utmost innovative and imaginative flair and indisputable technical talent to thrive, Diffrent Music has been responsible for the release of some truly inspiring sounds, and not only renowned for it’s music, Diffrent is home to everybody’s favourite pink giraffe, Leonard. ‘Evolution of the Giraffe’ an album that dropped on the label today is an eclectic fusion of sounds, styles and vibes. Although each tune is entirely distinct the music comes together flawlessly to represent not only the past and the present of the label but also the future. A compilation album that features a number of artists involved with the label, if you like your music with a deep, dark wholly consuming bass line, unexpected and unpredictable yet entirely compelling this is an album you certainly shouldn’t miss. A strong family ethos has transcended through the strong support and excitement generated around the album release, a strong indicator of the big things to come in 2014. Hello Dexta, how are you? And what are you hoping to find in your Christmas stocking? Hey, to be honest, I’ve already started using it as a 2nd sock, my house has single glazing and it’s started to get worryingly cold around my gaff. Leonard the pink giraffe has become a bit of a celebrity in D&B circles. I’ve been doing some giraffe based research and have discovered that giraffes participate in an activity called ‘necking’ (a kind of fighting in which they hit each others necks) is there anybody in D&B you believe would be able to compete with Leonard for the ‘necking’ title? That’s a good one, there are quite a few rowdy people in D&B, however, while very proud, Leonard is a very noble and caring spirit, and does not participate in ‘Necking’ or any form of violence. He’d much prefer it if everyone followed his example and saved the aggression for the dance. I don’t think a rave goes by without catching someone in a Diffrent Music t-shirt, how did you feel when you first started seeing people you didn’t know supporting in this manner? And what do you think it is about Diffrent that gets people so excited? Well the only reason I made them in the first place was due to strangers on road stopping me to compliment or ask me where did I get my T-Shirt from, (I had a few one offs made for DJ sets and general street-wear attire). I thought it was crazy!! Not too long after they went on general release and you’re right, they have been popping up on the chest of many girl and boys in the dance hall and have even been spotted in a Hertfordshire gym! I think the logo is just fun, and not so serious, and that kinda makes people remember that they are here to live not conform, which in turn, arouses and excites people – ain’t it ? ‘Evolution of the Giraffe’ is a real milestone for the label. How would you describe the evolution of the label and its sound? And what were the aims for the album? Yeah massive, who’d of thought they’d let us go on to DIFF020 (and nearly four years). It’s been a real hard and tough year, and when that number 20 cropped up in the schedule, I literally had to pull out all the stops and do something people actually really enjoy, appreciate and can be a part of. So I thought, CD, Vinyl, Download, Party and I wanted many of the artists involved with the label to be a part of it, and then it sprang to mind that I needed to do a celebratory milestone LP to conquer all this. As you know (Leslie), I like to involve everyone who’s close by and let them share the experience with me, this was the main goal, and I think that Friday will see the start of this operation and 2014 will see the continuation and growth of the Diffrent Music crew and extended family! How did doing an album project compare to the work you’ve been doing with singles and EP’s? I can’t begin to explain the difference. It kinda makes a Single/EP project seem easy (which it isn’t). There are several similarities in the preparation, what with legalities and paperwork, but getting the album together, fitting it together having bits made to be put into place and having the whole thing ‘perfected’ to the best level we are possible of has taken many sleepless nights, changing schedules and the putting on hold of other things to make sure it works. I am 100% confident in this though, always have been, and It’s due to the amount of support the label has had, the love from the fans, people that buy and play the music, dance to the tunes in a dance, come to the events etc… That’s why I’ve included everyone in this project directly and indirectly! The album is available to buy on vinyl, a format that’s quite controversial – can you tell us firstly why vinyl is important to you? And secondly, how you feel about the relationship between vinyl and the drum and bass scene, its DJs and its listeners? Well firstly a record label is not really a label until it labels something, and you can’t do that to an mp3 (sadly), so it’s always been a big thing for me in terms of industry standard. It sounds and feels a lot warmer than a CD or serato files and also looks nice in a box, on a shelf, in a frame etc. The records are collectors edition, very limited and will become hard to find very quickly, this is something that I find attractive, I buy into art like that a lot, whether it be prints, toys, records or T-Shirts. The Drum & Bass scene has always revolved around 12” vinyl, any DJ pre-2000 will have hundreds of records, it was the thing that converted the passion from a DJ set into something we could hold and get to know one to one. I have to admit I do use digital music 90% of the time, due to the fact most music that I’d like to play is sadly not available on vinyl, and would cost me way too much to cut for a one off play. All of that aside, Diffrent Music has always been a digi label and we are fully embracing that, and trying to come up with music packages that make people happy and wanting to be a part of it. As well as running Diffrent, you’re a producer / DJ in your own right, and ‘Slugger’ a track by you and Mauoq features on the album. How do you balance label work with your own artistic work? And was it difficult choosing your own work for the album? I started making music when I was 15 at school, I used to spend every night making beats and noises, I’ve always made time for it, it’s only the past year where I’ve taken it seriously and actually found my way around my own studio and started the journey of exploring and creating my own sound and vibe. Balance wise, the label takes up most of my life, but I tend to put away a day or two for creative business, without this balance I’d probably lose focus and god knows what I’d end up doing. ‘Slugger’ was actually ‘signed’ to the label about a year ago, I moved it to the album with Mauro’s permission of course due to it being very fitting, and in demand, however back to your question, it should have been released already but I found it hard to chose something else of my own work to use with ‘Slugger.’ So yes, it was extremely hard, but it made perfect sense! The music you release is pretty diverse, referring to your Mighty Boosh reference in a previous interview, do you ever have the fear when signing a tune – that you’ve found too much ‘funk’ and that it won’t be responded to well? Funny you should say that, sometimes I really hunt down stuff that I think people will struggle to ‘get’ as that’s the whole thing, taking chances with music that we love, not because every other D&B DJ will instabuy. It’s a bonus when people buy into it and it funds the future, so keep it up. It’s obviously doing alright so far so thanks a lot to everyone mwah!!! You mentioned in a previous interview that you learnt a lot about the business side of the music industry through a man you met as a result of the job centre, and also through the transferable skills you learned in running an office / business logistics. What would you say is most needed to run a label? And are there any things that have been involved with running a label, you would never have expected? One thing I will say, It’s not for everyone, it’s not for people who expect things to just ‘happen’ and if you’re in it for money, then skip on to the next question now. When I was at the studio through the jobcentre link (and I still can’t recall the blokes name) I was given a lot of the harsh truths via research and talks, he wasn’t easy on me, and it really worked, as when I left the (unofficial) ‘program’ I knew that a lot of time, money and hard work was going to be needed to go into the business. I kept my aims high, remained positive about the idea and I went out, got myself a job and saved up the money to invest. Luckily this was in a small family friends business where I learned the ins and outs of business, which looking back proves about the laws of attraction and positive mental attitude. This has remained throughout and the growth is healthy I think. There have been loads of unexpected ups and downs and lefts and rights, but without them, we’d all be stale and robotic. You have ‘The Belgian Connection’ (Mtwn, M-Zine & Scepticz and Bredren) doing big things on the label, what are your thoughts on the future of drum and bass with particular focus on the Internet’s influence? And how do you feel the future is going to map out for underground/ independent labels? Glad you mentioned that, I vote we bunch them guys and call them that, or ‘The Belgian Collection’ or something! My thoughts on the future of Drum & Bass are that as long as this music is being made and clubs are letting promoters and DJs in to create dance’s then it will live on and continue to grow as it has done for the past 20 odd years. I think that a lot of the major labels are putting out silly music and really numbing the masses out there, but it’s our game to try to convert these people. It’s been going on since day one and I think that hopefully labels and artists will survive – I remain positive. People often say that drum and bass is a genre in which there’s no middle, either you’re not keen, or it becomes a big part of your life, having been involved with the genre for a while – what do you think about this statement? Whoever started this saying isn’t far from the truth. Drum & Bass is a small community of nerds who make and play tunes to people. We all started doing this because we didn’t turn around and leave the rave half way through the night. At the same time there are people who find themselves keeping an eye on the scene and cherry picking their favourite bits, so it’s not all one big exclusive tribe. However, once you do start getting into the habit it is a hard addiction/virus to shake! You’ve been quite involved with radio over the years, and recently appeared on Rinse FM – which I must admit is brilliant and so deserved! What’s the story of you and radio? Radio has always been a big part of my life, especially where it comes to music. I never got hugely into telly, movies etc until my adult life. I used to come in from school put the radio on do my homework and it’d go off minutes before I went to sleep. I’ve played on a few of London’s pirate stations and on numerous web radio websites. I’ve always enjoyed spinning tunes and making noise about them but it’s hard to explain as it’s deep inside me. Rinse FM was really good only a few weeks ago, first professional joint I’ve been to. They had spare needles, spare decks, technician who was really helpful and digging the sounds, so made it much more relaxing and proper! The launch was at the infamous “Diffrent’s House”, can you tell us a bit about the venue? And also if you have any more future plans on the Diffrent event side of things? Yeah the venue is truly amazing, the staff are very much on a level and the actual place is so perfect. It’s owned by the ‘Geffrye Museum’ has been there since time began, it even has plants growing on the roof. You will have to come down to a future party there to fully appreciate, words cannot describe! There should be a video on youtube of a guided tour I done a while ago. If you had a laboratory, with endless possibilities not dissimilar to a certain cartoon… What would you create? I already do and I have created many a monsters… Jokes aside, that was one of the few shows I did watch as a youth, and the inspiration behind my name and my mixtape (not the serial killer – I’m nice and cuddly). If I had Dexter’s Laboratory, I’d love to try and make something loosely related with time travel, maybe some way of slowing down time, so we can all get more done. Something useful to the world anyway. What should we expect from the ‘Diffrent Culture’ of the future? And what should we be looking forward to in 2014? In one word; “GiraffeStep”. Thanks for having me, and if I’m allowed, can I send a massive shout out to my misses for helping through literally everything! Go and listen the album if you have not already, and buy a copy while they’re available. Tune into Dexta’s Lab mixtape and the GiraffeCast all can be found via our website. Thanks again and bonjour! ‘Evolution of the Giraffe’ is available to buy on vinyl, CD and in digital format (here)!